It’s hard to believe that it’s February already. So much happens each and every week that it’s hard to keep up sometimes. Here are some of the tabs that are open in my browser this morning along with some random thoughts…. Last weekend I was on the road attending my daughter’s Power League volleyball tournament in Sacramento. My brother Robert filled in for me admirably. I didn’t ask him to take up the reins, but I certainly appreciate him filling in the gap. Thanks, bro. Dig the mug by the way. 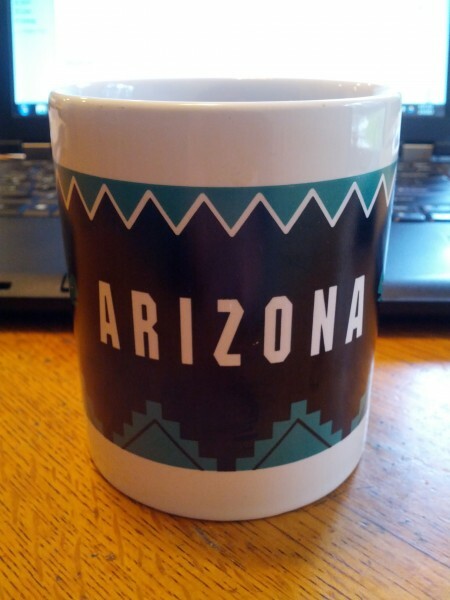 I went through Phoenix, AZ twice this week while traveling for work, which made me think of the coffee mug to the right. It was once of four sent to me by Jason DeVillains last year. Jason is better known to many as The Cynical Pharmacist. Jason and I met via Twitter(@TheCynicalRPH) and have been chitchatting via the web ever since. Perhaps the next time I touch down in Phoenix I can lay over for a day and Jason and I can grab a cup o’ joe together. Jason also blogs over at The Cynical Pharmacist. Check it out. – Sierra Club: “Civet coffee (kopi luwak): Can you imagine paying hundreds of dollars for coffee made from poop? Civet coffee is a rarefied brew made from the droppings of a nocturnal, catlike animal called the Asian palm civet. The lithe, long-tailed creature eats a diet of coffee berries, digesting the fruit’s fleshy pulp and passing the tough pit through its gastrointestinal tract whole (although enzymes break down the bean’s proteins). After the civet defecates the undigested coffee beans, they are then harvested, husked, washed, and roasted.” Yeah, about that. I like coffee, but this is a line I’m not willing to cross. – Warm Bodies was #1 at the box office last weekend as our fascination with zombies continues. It looks like it might be an entertaining movie. Last weekend my wife and I took in Bullet to the Head with Sylvester Stallone. It hasn’t fared well in the media, but I liked it. I continue to be amazed at Stallone’s ability to transform his body. Seriously, the guy is 66 and he’s in phenomenal shape. – Just in case you didn’t know, the Baltimore Ravens won Super Bowl XLVII by beating the San Francisco 49ers 34-31. I didn’t t get to watch the game, which makes me a bit sad as I look forward to it every year. And any chance to see the 49ers go down in a big ball of flames is a bonus. I followed the score via my smartphone, which led me to some anxiety during the second half. – Speaking of the Super Bowl, that means that I’m now officially in my football withdrawal period. It’s often accompanied by bouts of depression and irritability, followed by thoughts of August when football season kicks into high gear again. So if you see me and I treat you like crap it’s because football season is over. No offense intended. – The Northeast is getting crushed by a giant winter storm this weekend. I feel bad for the people that have to get out and work in those conditions or worse yet the people who have no shelter. I’m not a cold weather guy and can’t imagine being in a blizzard like that. Good luck everyone. – How about this little tid-bit from Intel. Whoa! – The agenda for the 2013 unSUMMIT is now available, and can be found here (PDF). I’ve been to the unSUMMIT a couple of times. It’s a smaller conference, but certainly worth attending if you’re looking for information about barcoding at the point of care. In addition to lots of talk about barcoding there are also a few forward thinking presentations each year. One year I heard Dennis Tribble speak on RFID and RTLS technology. That presentation helped spark some new interests for me. – Want to read a sad commentary about the state of professional baseball? If so head on over Bluebird Banter and check out If You’re Not Cheating, You’re Not Trying. “A look at cheating and cheaters in the history of major league baseball, questioning why today’s rule breakers are considered so much worse than those of yesteryear.” In my opinion, if you’re cheating to win, you shouldn’t be playing the game. As sappy as it may sound, I believe is playing fair, with ethics and morality. – There has been a lot of rhetoric going back and forth this week about head injuries in football and all the lawsuits that are being brought against the NFL by former players. I have to believe that these guys knew what they were getting into when they signed on the dotted line. I mean what did they think would happen if they rammed their heads against a brick wall several hundred times? I also find it hard to believe that they would have made a different decision if anyone would have said, “hey, you might get hurt while playing professional football”. My dream, like every little boy’s dream, was to play in the NFL. Unfortunately I ran out of talent, size and athletic ability in college, which happens to most kids that play football. Only a tiny percentage of those that play the game will ever make it to the NFL. If given the opportunity would I have signed to play in the NFL knowing there was a potential for harm? In a second. Would I have signed then knowing what I know now? In a second. People take risk all the time. At least these guys are doing something they love. It shouldn’t be up to the NFL to coddle them once they’re presented with the facts. Don’t forget, these are not kids. These are grown men being paid millions of dollars per year to play a game they love. – Speaking of the NFL, I believe they are on track to ruin the sport within the next couple of decades. I believe the game will become a shell of its former self within my lifetime. At some point it will sink to the depth of the MLB where some people enjoy it, but the popularity will die. They’re already watering down the game to a point where I find it difficult to watch week in and week out. – Did you know that there was such a thing as an Optimizing Pharmaceutical Patient Adherence Conference? Neither did I. Here’s the agenda. I came across the information via a Tweet. I would give the Tweeter credit if I could only remember who it was. Anyway, the Tweet led me to a post at patientadherence.com that provided me with a summary of some of what took place at the conference. Interesting stuff. – Medgadget: “Clinicians at Mercy Medical Center in Cedar Rapids, Iowa are now the first in the U.S. to have an i.v.STATION ONCO robot from Health Robotics (Bolzano, Italy) that compounds and dispenses injectable chemo medications…The i.v.STATION ONCO automates the process, essentially guaranteeing the contents of the vials and minimizing exposure of staff to the poisons. Mercy Medical prepares 11,000 such vials each year, so clearly there’s both a safety and efficiency benefit from automating this process.” – Is it time to start giving robotics serious consideration in the IV room? Maybe, maybe not. It all depends on what you want out of them I suppose. – I find nanotechnology fascinating, which is why this article at PJ online is worth a read. “Nanotechnology refers to the science and engineering involved in the design, synthesis, characterisation and application of materials and devices whose smallest functional dimension is on the nanometer scale (one-billionth of a metre). For some perspective, a human hair is approximately 80,000nm and a red blood cell is 7,000nm wide.” Several examples of nanotechnology use in medicine are given. Of particular interest to me are the examples for using nanosystems for drug deliver. I think we’ll see traditional medication delivery disappear in the not too distant future. That’s some cool stuff right there. – ISMP recently published results of their survey on How hospitals are managing the preparation and purchase of high-risk compounded sterile preparations (CSPs). Some of the results are eye opening, like the fact that 13 percent of respondents from hospital pharmacies and external compounding pharmacies said contamination of sterile medications had happened in their facility in the past year. That’s a bit disturbing. And how about the fact that only 50 percent of pharmacists believed that their facility didn’t have a contamination incident in their sterile compounding. Oops. ISMP concluded by saying that “[the respondents to the survey] made it abundantly clear that sterile compounding of high-risk preparations is an exceptionally complex issue riddled with deep frustration regarding the conditions that require or promote the practice, nagging doubts about both internal and external pharmacy staff training, concerns regarding sterility and quality of CSPs, uncertainty regarding a solution to the problem, and empathy for the victims of contaminated CSPs.” IV rooms are dangerous places. It’s sad that it took a catastrophic event to make people look at their quality and safety. – I found myself in Minneapolis at the Mall of America this week. I was there for work. My hotel happened to be across the street from the mall so I wondered over there one night to check it out; impressive place. To my surprise I found a Microsoft Store where I was able to play with a Surface Pro tablet. They had four on display, but wouldn’t sell me one. They officially go on sale today, February 9. I spent about 30 minutes playing with the tablet, including the stylus, etc. I was thrilled with what I experienced. – I often look to other industries for ideas around automation and technology. There’s an interesting article in American Laboratory on The Paperless Laboratory: Automated Lab Instrument Qualification on the iPad or PC. Some of the information presented there is directly applicable to clinical pharmacy. Pharmacists use a ton of paper to track various patient information, perform kinetic consults, and so on. – The concept of Medical Homes has garnered a lot of attention over the past couple of years. Everyone thinks they have a tremendous upside. Unfortunately the literature doesn’t necessarily support that view. A recent article in the February 2013 edition of The Annals of Internal Medicine reports on the results of a systematic review of the literature. The article concluded that “Moderately strong evidence suggests that the medical home has a small positive effect on patient experiences and small to moderate positive effects on preventive care services. …Current evidence is insufficient to determine effects on clinical and most economic outcomes.” The article is kind of long and involved, but worth a read. – I think the ASUS TAICHI 21 is a cool, and unique, Windows 8 convertible. It’s the only machine that I’m aware of that offers two screens: one traditional and another on the outside of the lid. That’s right; when the laptop style machine is closed the lid can be used as a touchscreen. Unfortunately, as Engadget points out “as inventive as this is as a concept, the finished product isn’t quite what we all thought it would be.” Battery life came in under 4 hours. That just wouldn’t work for me. Love the ingenuity, but I wouldn’t buy one unless I had a lot of excess cash just sitting around. – It’s no secret that I’m a fan of cloud computing. My digital life has been slowly moving that direction for a few years now, and as the technology improves I see no reason to stop. One thing that keeps people from using more cloud services is unsubstantiated fear. GigaOM has an interesting article where Dave Girouard, CEO of UpStart debunks some of the “delusions that companies have about the cloud”. In the end Dave writes that “the spoils of cloud computing will accrue to those organizations that break through the insanity, that resolutely fight through these distractions and ambiguities to drive this radically better approach to computing throughout their organizations.” While I think we have a ways to go before pure cloud computing is suitable for the average consumer, I think we’re well on our way. – Got myself quoted in an article this week at Pharmacy Practice News. “By creating lists, filtering who I follow, and searching using different hashtags, I can pinpoint information and narrowly focus on what I’m looking for,” said Jerry Fahrni, PharmD” – It’s not often that I get to see my name in an article. Even though it’s Pharmacy Practice News I think it’s cool. – And just because it’s funny, Evil Stewie strikes again. That’s it folks. I’m off to a track meet. Have a great weekend. What the!? You stopped in Phoenix and didn’t let me know? I’m pissed off! Next time you’re coming into Phoenix send me an email and I’ll meet you at the airport. I know that I blog anonymously, but like I said from the start, anyone who “really” wants to know my identity, can probably figure it out. I’ll do it the next time I hit the ground in Phoenix. Doesn’t happen often, couple of times a year.